Surveying his newest acquisition, 55-year-old Pedersen wasted no time... he immediately set about fulfilling his boast to creating a theme park to be heralded on billboards throughout the East Coast as "Africa, U.S.A." Of his 350 acres, he chose the northern portion, the 177 acres now known as the subdivision Camino Gardens, as the site for his park. Fruit trees from all over the tropical world were imported: 1000 bananas, tea, vanilla, tapioca, sago, chicle, sausage, palms, kapok, ginreg, camphor, henna, pickle, lipstick, ebony, mahogany, and olive... Bamboo and numerous other exotic trees and shrubs which Pedersen imported remain today and may still be seen in Camino Gardens' "Park at the Lake". Opening day of "Africa, U.S.A." in February, 1953 was filled with fanfare and hoopla as local dignitaries welcomed the hundreds of new four-footed settlers to town. At age 65, Pedersen could take no more. 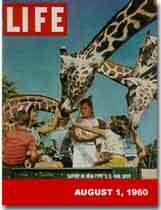 In September, 1961, the park which had been one of America's best known tourist attractions for eight years, was closed. The following month Pedersen sold his 177 acres to developers, a Rhode Island-based firm... for $1,000,000 cold cash... Within thirty days after the sale, Pedersen sold the remaining animals to zoos and circuses throughout the United States and Mexico. 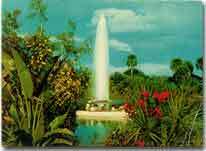 "At this site in 1953, John D. Pedersen and his family established "Africa USA," a major Boca Raton tourist attraction for nearly a decade. The 350 acre site drew some 2,000 visitors daily to view the park's camels, giraffes, elephants and other exotic animals and plants. In the park a "Watusi Geyser" erupted hourly from the rock still visible in the lake, throwing 1,000 gallons of water per minute, 160 feet into the air. Near the left edge of the lake are remnants of "Zambezi Falls," the park's 30 foot waterfall. Dedicated by the Camino Gardens Association in March 2003 to commemorate the 50th anniversary of Africa, USA." For a complete site dedicated to the memory of Africa, U.S.A. please visit http://africa-usa.com/. Copies can be ordered via this website. This site is provided by Hawk-Eye Management, Inc.